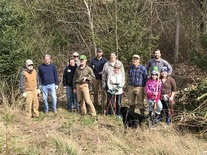 Volunteers are needed for a Miller Creek Trail Work Party on Saturday, July 21. The Miller Creek Trail in Burien provides important recreational opportunity and valuable fish and wildlife habitat. WHAT: We will remove invasive species – including Himalayan Blackberry and Scotch Broom. This work will help prepare the site for planting of native trees and shrubs later in the fall. WHEN: Saturday, July 21, 9:30 a.m. -12:30 p.m.
Future dates include October 27th and December 8th. WHERE: Miller Creek Trail, 14455 Des Moines Memorial Drive in Burien. Parking available on the northwest side of Des Memorial Drive across the street from the Des Moines Way Self Storage. Visit the Miller Walker Basin Volunteer Calendar for more information. Bookmark and check back for program updates!